If entrepreneurs and futurists are to be believed, artificial intelligence will have a transformative impact on many aspects of society–with uncertain implications for education. A new report attempts to get beyond the prognostication and offer a precise gauge of where AI’s development stands right now, as judged by a variety of metrics across research and industry in the U.S. and internationally. The AI Index 2018 Annual Report was produced by a group of researchers, led by Yoav Shoham, a professor emeritus of computer science at Stanford University. The measures in the report are not directly related to K-12 education, though some, such as the growth in venture capital and academic research, seem likely influence the development of AI in school settings. One measure outlined in the report is the publication of AI-focused academic papers, where the release of research focused on artificial intelligence topics has outpaced the amount of published research on computer science over roughly the past two decades. The interest in artificial intelligence in academia is not limited to the United States. Europe has consistently produced the largest number of AI papers, currently about 27 percent of them, according to the report, followed by China (25 percent) and United States (17 percent). But the number of papers published in China jumped by 150 percent between 2007 and 2017. About 30 percent of AI-focused patents originated in the U.S., the authors of the index say; Japan and South Korea hold the next-highest number, at 16 percent each. South Korea and Taiwan have shown the most growth in patents. Interest in AI has jumped by many other measures, too. Undergraduate course enrollments in AI and machine learning have risen in universities that have computer science programs–and not just in the United States. At China’s Tsinghua University, enrollment in AI and machine learning courses was 16 times greater in 2017 than it was in 2010. Economists and educators have speculated about how AI might influence not just teaching, but the future job market, and what schools need to do to prepare students to compete for careers. 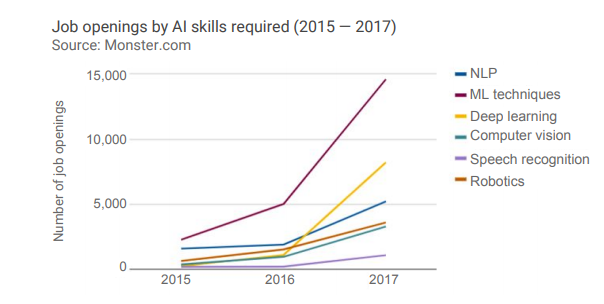 The AI Index shows a strong growth in the number of job openings with AI skill requirements. Machine learning is the skill that is listed most often as a requirement, the report found. But deep learning–essentially work focused on imitating the human brain in processing data and creating patterns for decision-making–is the required skill growing at the fastest rate. It grew by 35 times between 2015 and 2017. Other AI-focused skills often required include natural language processing and robotics. Additionally, a growing number of companies in North America, China and other developing markets, and Europe are embedding “AI capabilities” in at least one function or business unit, says the report, citing a survey taken by McKinsey & Company. Robotic process automation, machine learning, and conversational interfaces were among the AI capabilities cited most often. This is the second year the index has been published. 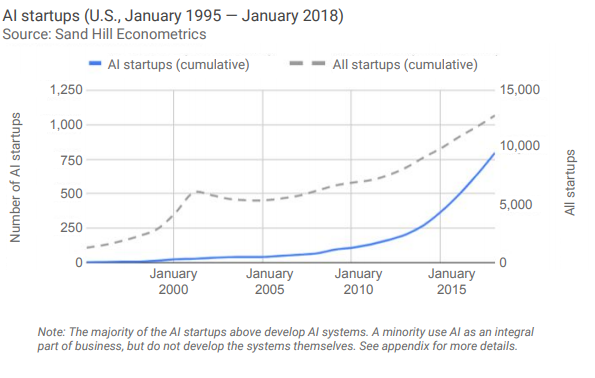 The new report, which was released in December, was broadened to include more data on AI’s presence outside North America.